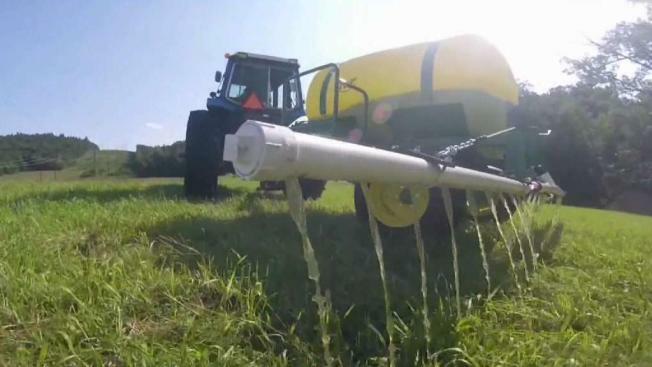 A research group in southeastern Vermont says there’s a sustainable form of fertilizer that can feed the world’s crops and protect water quality by removing nutrients from sewer systems. That fertilizer, the Rich Earth Institute says, is our own pee. “It’s a taboo that needs to be discussed,” said Kim Nace, the co-founder of the Rich Earth Institute in Brattleboro. The institute studies and demonstrates the potential for our bathroom waste to be reused to fertilize farms or gardens, Nace explained. She said human pee is full of nitrogen, potassium, phosphorous, and other elements that can really help plants flourish. The liquid nourishing farmer Dean Hamilton’s hay field in Brattleboro is urine that the Rich Earth Institute sanitized using heat. Roughly a hundred community members around Brattleboro are bottling their own liquid waste for the Rich Earth study, bringing it in five-gallon jugs to a rather pungent collection site. Then, in a lab, tests are looking at the effectiveness of fertilizing with urine, and whether any trace amounts of medications could be making it from the pee to the sunflowers and veggies in the garden. “There’s very little pathogen issues with urine, but we pasteurize it, and that kills anything that’s in there,” noted Rich Earth research director Abe Noe-Hays. Noe-Hays said the concept could slash reliance on chemicals and alleviate pressure on the nation’s aging wastewater treatment facilities and sewer pipes by diverting pee instead of flushing it. He pointed out that cow, horse, and chicken waste are already fixtures on farm fields. “It’s all animal manure of one sort or another,” Noe-Hays said, likening urine fertilizer to other, more familiar, forms of waste used in agriculture. With interest from universities and grant money from the National Science Foundation supporting its work, the Rich Earth Institute plans to keep at this, insisting that—despite the uphill climb it’ll take to attract converts—there’s a golden opportunity in urine to fertilize the future.